This week (10th-16th June) is Carers Week 2013, a UK-wide annual campaign that has the aim of raising the profile of carers, recognising and celebrating the contribution of the nation’s 6.5 million carers to the people they care for, their communities and society, and helping the public to identify themselves as carers, accessing the support they need. Carers are amongst our hundreds of readers enjoying Get Into Reading groups across the UK each week. Sharing reading with others offers carers the chance to relax, take a break and enjoy some much needed time for themselves, with the company of others. Benefits of our Get Into Reading groups include reduced social isolation, stability and support, and increased personal confidence, all of which are of significant value to the lives of carers. 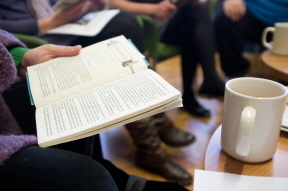 As well as being able to come along to our open community groups, we currently run a number of groups especially for carers in Liverpool (Toxteth Library), Wigan (Wigan and Leigh Carers Centre), Wirral (The Lauries Centre) and the South West (Feel Better With A Book groups throughout Devon). Information on all of our groups aimed at carers, as well as our open groups, can be found on the Reading With Us section of our website. I heard about Book Break at a carers information event at Central Library and I went straight to the library as the group was about to start that very day. I was desperately lonely, had no friends and nobody to talk to. I had arrived in the UK a year previously and after the initial phase and excitement of setting up the household and getting the family settled in I was really feeling the isolation and lack of connection. At home there is little intellectual stimulation or conversation. My husband is away at work from 8am to 8pm and when he gets home he is very tired. My son, who is 20, has cerebral palsy and epilepsy. This has been a big sorrow in our lives which we make light of but the underlying tragedy is always there, that he will never get ‘well’. I started to attend every week as I just loved the group. I thrived on the mental stimulation and the real connection with other people. I have learnt to read and appreciate really difficult books and I think it has helped me feel better about myself. Somehow reading the book in a group makes it feel achievable when on my own I would not have even started. Recently I enrolled on a short course at Oxford University which requires me to do a lot of pre-reading. Before attending Book Break I would not have had the confidence to read the required material, now I know I can. Book Break has shown me that it is possible to read something and not understand it initially but that with a little time, effort and application not only can I understand it, but I can love it. One of the great things for me about the group is the regularity of it. As I don’t work I have little structure in my life, Book Break helps me with this. It happens every week at the same time and I know every week where I will be then. When I think back to how my life was before coming to Book Break and how I am now, there is no comparison. I was lonely, isolated and struggling hesitantly to adjust in this new country. Now I feel part of something important and meaningful and have made some great friends. My life is so much easier. The Book Break group has opened my mind to a world of new experiences. Read through more of our Reader Stories on our website, as well as finding out how you can Read With Us at our groups for carers around the country.